Few tools have elevated the standard of patient care more significantly than the Wireless Medical Telemetry Service (WMTS). Real-time remote monitoring of critical care patients has given clinicians the ability to immediately detect and respond to life-threatening conditions. The resulting healthcare impact has been profound, with monitored cardiac event sufferers having significantly higher survival rates than their unmonitored counterparts. Today, conventional hospitals represent approximately 8,500 WMTS deployments across the United States, a number growing at an astounding 20% per year. Commercial medical telemetry spectrum will permanently safeguard patient monitoring at the nation’s hospitals, while significantly expanding the number of patients that can be effectively monitored. TerreStar's commercial medical telemetry application will immediately expand WMTS capacity nationwide by at least 67%, while removing interference threats. Moreover, additional spectrum will be used for wireless medical telemetry use cases not possible under WMTS rules. 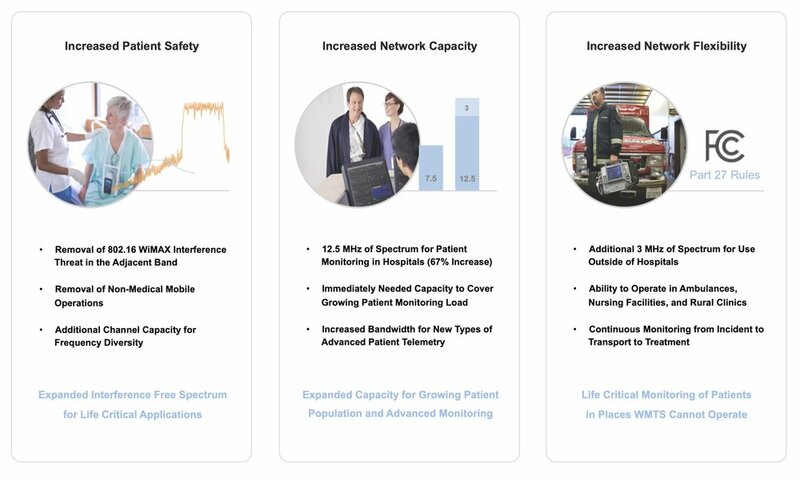 Monitoring has a direct impact upon survival, and the addition of commercial 1.4 GHz spectrum will ensure that more patients can be monitored. In addition, expanded channel capacity will allow new types of real-time patient metrics to be carried over WMTS systems.